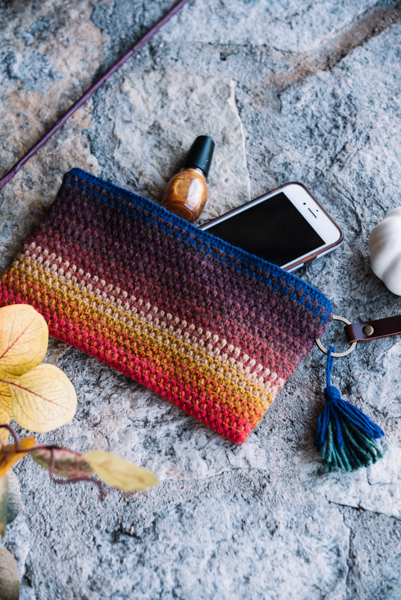 This beginner friendly clutch makes an excellent hook case for your on-the-go project bag. 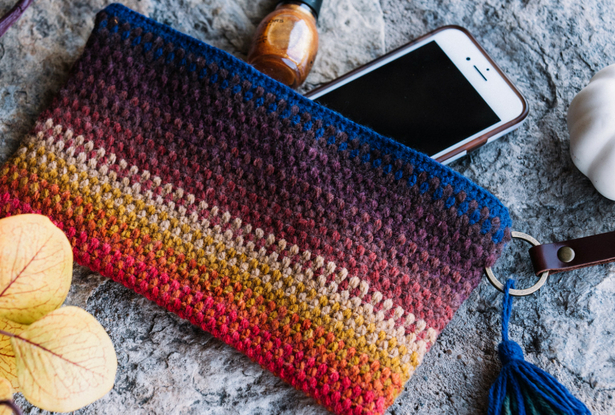 Serape-inspired stripes create a woven gradient look, while a leather strap, invisible zipper and a double-layered tassel complete this striking boho clutch. Separate each cake of yarn into its individual colors by cutting at the transition points between colors. From Centaur, select dark purple (MC), dusty red (CC2), peach (CC3), terracotta (CC4), and light yellow (CC5). From Chimera, select brown (CC1), gold (CC6), orange (CC7), red (CC8), and green (CC9). Fold work in half, aligning Row 1 with Row 66. With sewing needle and thread, sew invisible zipper along Row 1 and Row 66, forming a tube. 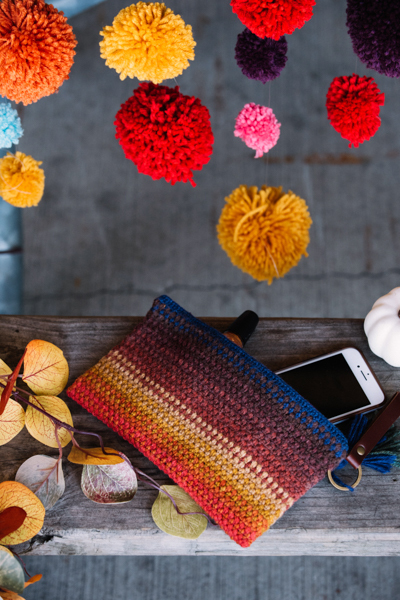 With MC and tapestry needle, sew along both sides of clutch using mattress stitch. Fasten off. Weave in ends. To make the tassel, cut 20 10” / [25 cm] pieces of CC9 and 20 6” / [15 cm] pieces of MC. 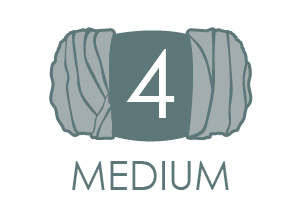 Cut a 4” / [10 cm] length of MC to use as a tie and place it horizontally on a flat surface. Place the MC pieces vertically on top of the tie, then place the CC9 pieces on top of the MC pieces. Tie the 4” / [10 cm] MC tie around all pieces to fasten. Wrap top of tassel with a 6” / [15 cm] length of MC to secure. Attach tassel to key chain fob with a 6” / [15 cm] length of MC. Trim tassel as desired. Attach key chain fob to clutch by threading through Rows 3 and 6 as pictured. Great idea! I could use a zipper tutorial also! For those of us new to zippers, a video tutorial would be amazing. Actually, any new skill like that would benefit. 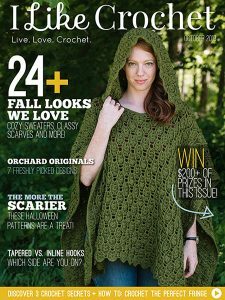 Or pictures showing how to stitch in the zipper if a video is too time/cost prohibitive to produce.